I know a lot of people have cultural food traditions passed down through their families. Ours always had to be very simple to make and clean up because we opened our gifts on Christmas Eve and spent Christmas Day with relatives. We’d eat and soon after take a drive with Dad to look at the lights and see if we couldn’t spot Santa and his reindeer. Inevitably, by the time we returned a little bummed because we didn’t catch sight of him, Mom would run out and tell us we’d just missed him! And as proof, there’d be stockings filled and a pile of gifts under the tree. Obs, Mom would have a lot to do to pull all this off, so our simple dinner was always Maid Rights and I have that recipe here, too, Maid Right Sandwiches Instant Pot or Stovetop. Somehow as my kids became teenagers, that morphed at my house into Chili. I loved that I could make it ahead and have it ready. Chili is always better the next day. But with the Instant Pot there are no worries. If I want to make The Best Instant Pot Chili ahead, fine. If not it’s quick enough to do even on the same day but you’ll want your beans done ahead or you’ll want to use canned beans. And of course, this Chili is great for just about any event you want Chili for. Game Day, maybe? Or just any old day. You can never go wrong with Chili and done in the Instant Pot it tastes like it was lovingly simmered for hours. The Best Instant Pot Chili has all the tradition of my much-loved stovetop chili with all the little special touches I’ve added over the years. It’s really a killer Chili by any standard. I think you’re going to love it. 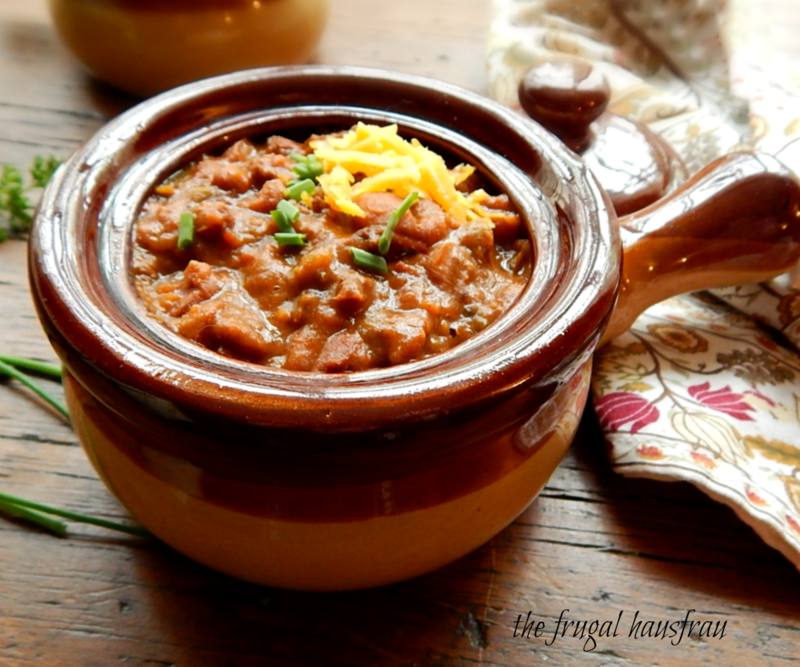 There’s flavor for days, deep and rich and this Chili is nice and thick. There’s the Chili Powder in this Chili to round out the spice but a little Jalapeno for heat. I gave you a range from mildly spicy (2 jalapenos) to hot (4 jalapenos) depending on your taste. If you look at this recipe, you are going to notice right off the bat (I hope) that The Best Instant Pot Chili calls for already cooked or canned pintos. That’s because this is the BEST and I’m not messing around with what so many people say can be done but really can’t. Or at least not be done well – and that’s starting with raw, unsoaked pintos and cooking them with/in the ingredients for the Chili. That will NEVER give you anything but a range of less and more cooked pintos. You’ll have to cook it forever in the instant pot and you’ll end up with either some pintos cooked right and some crunchy or some pintos cooked right and the others mushy. People have different standards and some might argue but frankly, I’m just gonna be blunt and flat out say it – they would be wrong. I might consider such a thing if I’m planning on making chili, have ingredients already and they have to be used or tossed and I have the flu and can barely stand up and it’s all I can do to dump everything in the instant pot while the hungry kids starve – and I really don’t care how good it is because it will be edible. Just edible. But that’s not good enough for the Best Instant Pot Chili. If you’d like to cook your pintos ahead for the Best Instant Pot Chili, that’s great and better than canned. Either brine or soak overnight for the best beans, or brine or quick soak in the IP or the stove, then cook. Brining and cooking your beans ahead of time will ensure the pintos will be at the just right texture when the chili is done. Depending on the age of the pintos, where you are in the country and where you get your pintos, the amount of time to cook beans is a variable. Here’s my post on Soaking and Brining Beans. Here’s my post on Spicy Pinto Beans Instant Pot or Stovetop. Leave out the spice if you want to start with plain pintos. Always buy your ground beef on sale and break down to the portions you’ll family will use. Stock up on canned goods like tomatoes when they’re on sale. There’s never any sense in buying them when you need them – instead buy them at a low. Pintos should always be bought, if you’re using dried, at a place with a good turnover. Check the Mexican or ethnic markets if you have them in your area; they’ll likely be much fresher – and cheaper! If you go with canned pintos, they’re not going to break the bank, but dried pintos are less. A pound of pintos is about 4 1/2 cups once cooked, a can about 1 1/2 cups. I do like to buy my jalapenos at Aldi, where they come about a dozen to a package. Then I roast them all at once, steam and peel them and put any I’m not using into Ziplocs, two to three to a package – they are ready for next time. The other potentially pricey item is beer. Sign up for email alerts from your favorite store, watch for sales and pay particular attention around holidays when beer is often at a low. If you do stock up on your fave beer, make sure you are storing it in a place where it will be stable and not keeping it around for too long. That’s probably NOT the garage! See what a specialist from the Brewer’s Association has to say. Hint: Roast the jalapenos as you brown the meat and cut the vegetables. Heat Instant Pot with 1 tablespoon of oil in the inner liner on Saute until pot is hot. Add in the ground beef, breaking down as it cooks until it has lost its pink color. Add in the onions, bell pepper and jalapenos and continue to cook, stirring now and then, until vegetables have softened. Add a lid, partially ajar, to speed up the process. As the ground beef mixture cooks, to a small bowl add the spices, the chili, cumin, salt, paprika, cocoa & oregano. Mix together. When the vegetables are tender, drain the mixture, if desired. Add the garlic, stir, then all the spices and herbs. Stir, let toast for a few minutes until spices become fragrant. Deglaze with the 1/2 beer. Add in the pintos, then without stirring them in, add the tomatoes on top. Cover with lid fitted with liner, seal and set Instant Pot to High Pressure for 35 minutes. When done, allow to sit for 10 minutes on the Keep Warm function, then release the remaining pressure manually. If a thicker chili is desired, mix the Masa Harina with 1/2 cup of the liquid in the chili. Set the Instant Pot to Saute and when it begins to simmer, stir in the mixture. Simmer for several minutes, paying special attention to the bottom of the pot; a plastic spatula works well for this. Turn off the Instant Pot, but continue stirring until the chili is no longer simmering. Garnish as desired with Sour Cream, Cheese and/or Green Onion. Arrange jalapenos in a row on a foil lined cookie sheet, just touching each other. Place about 4 inches under the broiler. Broil until blistered, two to three minutes, then remove sheet and turn the jalapenos, broiling again until blistered. Repeat until all sides are blistered and slightly charred. Place in a small paper bag or a small bowl, sealed with plastic wrap and let sit for about 10 minutes to steam. When cool enough to handle, remove the majority of the charred skin. Roasted jalapenos freeze well and a great shortcut is to make more than needed, then divide in small portions and freeze. I’ll be taking this Chili to Fiesta Friday, where the best posts this week will be decided by vote on Tuesday. Don’t forget to stop over! This entry was posted in Click here for Bargain Meals, Click here for Fabulous Food Posts and tagged Alcohol, Beans, Beer, Bell Peppers, canned beans, canned tomatoes, cheddar, Cheese, Chili, Hot Peppers, Instant Pot, masa harina, pinto beans, Sour cream. Bookmark the permalink. I spent it with my daughter and five grandchildren and 2 step grandchildren! It was wonderful, but over way too fast! Okay I’ve got to get one of these hot pots I keep hearing about….sounds perfect for so many things. I am having so much fun with it! I don’t know if the food always comes out looking particularly aesthetically pleasing, though. At least for some dishes. I think it’s kind of revitalized my interest in cooking, though. I think that’s perfect for Christmas Eve, Mollie. Merry Christmas hugs! Hi Teagan, and hugs right back! Merry Christmas! Merry Christmas. Looks like you’re having fun with the new gadget in your kitchen. Chili is always a good dish. I AM having a blast with it!! Merry Christmas to you, too! See, there you go!! I must be a misplaced Texan, lol!! Merry Christmas! Thanks much, and the same to you! !